A more detailed map is here. Tour dates: 9-22 June 2002. Total distance: 1130 km. I had some problems finding a travel agent in Berlin for the train and ferry tickets that really knew the area, and didn't just look up package tours in glossy catalogs. 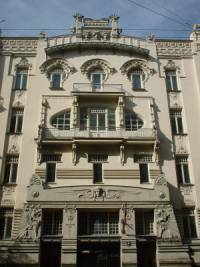 I eventually found a ``Holidayland'' agent on Leipziger Strasse, +49-30-2082423, ask for Gabriele Lode. Many guides stress the poor roads and recommend ridiculous tire widths like 40mm. Unless you plan to go offroad or use forest paths, you can forget that. The asphalt ranged from a little coarse with potholes to excellent. Usually the latter. I used 32/37mm, but one of us had no problems with 23/25mm. We had a total of 2 km of cobblestones, near Riga. Poland and the Baltic republics all used to belong to the Soviet empire, but they are modernizing at a furious pace. 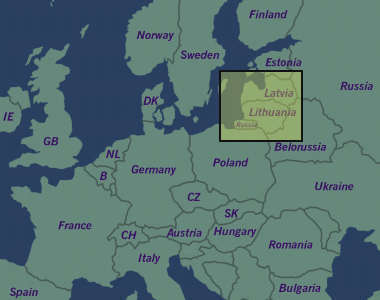 The Soviet legacy still exists in places, especially Lithuania, but it's vanishing fast, mostly through German imports. Everybody seems to drive German cars, they have German mailboxes, German phone booths, German yoghurt, German everything... We even saw a modern Berlin public transport bus in Jelgava, with the BVG logo still on it! Language is a problem. In Poland German is sometimes spoken, and in Latvia many people speak English, but lots of people speak only Polish, Lithuanian, and Latvian, respectively. My friends knew some Slavic languages and Russian, and we could often figure out words, but sometimes no communication was possible. At least we had no major problems in hotels. Food was no problem, except in Lithuania where there were very few stores between Kaunas and Siauliai (or they were too well hidden - a village here often means little more than a cluster of farm houses). GSM Cell phone reception was almost never a problem, although some networks support no data links. ATM machines accept EC cards without problems. Germans (and Croatians) need a passport but no visa. The weather in June was mixed - usually partly cloudy, sometimes sunny and hot, but we also got an almost solid day of rain and a few showers. In the text, I'll show the old German names of cities in parentheses to give search engines a little more to index. June 9. We took the train from Berlin to Gdansk (Danzig) via Szczecin (Stettin). Unfortunately the night train doesn't take bicycles. We spent the afternoon in Gdansk, walking the beautifully restored ancient streets that were very carefully restored after their nearly complete destruction in WWII. The picture to the left shows a small section of the main street. We stayed the night in the Dom Artiste hotel (reservations recommended, 400 Zl). June 10. We left Gdansk on the busy highway 75 south, and turned left after 12 km and went through Roszkowo, Grabini, Tczew (Dirschau), and Konczewice to Malbork (Marienburg). The road surface hat lots of potholes after the long bridge after Tczew. In Malbork we briefly toured the giant Teutonic Order castle, and went on to Elblag (Elbing). We stayed on the busy highway 50 for 10km, then turned right at the end of Stare Pole, and went through Fiszewo, Gronowo, and Jasionno. More potholes. We stayed at the very pleasant Pensjonat Boss (ul. Sw. Ducha 30, 0-55-2393730), nicely located at the river just south of the boat terminal. June 11. 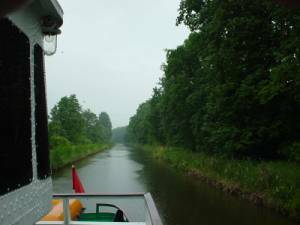 We took the river boat from Elblag to Buczyniec. The boats are supposed to leave at 8:00 but actually left 5-20 minutes early. Most of the other passengers were old people with binoculars on package tours; the river and the lakes that the boat passes through are very scenic, like in the picture on the right. The trip was fairly uneventful except for the five locks to gain nearly 100 meters. These are not waterlocks; they are grassy ramps and the boat is put on a cradle that runs on rails. We left at the top of the fifth lock in Buczyniec. By this time it had been raining heavily for several hours already, and we were planning to take the train from Paslek to Olsztyn (Allenstein). Fortunately the proprietor of the little restaurant at the ferry station took us to the train station; we would have gotten soaked. We originally planned to continue to Szczytno (Ortelsburg) by train, but we would have arrived really late, so we decided to take the risk and ride the 50 km from Olsztyn to Szczytno on highway 53. It was a beautiful ride, little traffic and the sun came out. In Sczcytno we found the hotel Krystyna at the lake. June 12. The next morning we stayed on highway 53 for 4 km and then turned left on a very quiet and scenic route recommended by our guidebook through seemingly endless forests, through Waly, Liepowiec, Ksiezy Lasek, and Klon. There were almost no cars all morning. The two pictures below are typical views from this route. We then crossed highway 53 at Rozogi, followed 602 to Faryny and turned left towards Wojnowo and Ukta, where we had lunch at the restaurant Alcatraz (bad name, good food) just before leaving Ukta on 609 north. Up to this point the asphalt was a little rough but ridable with narrow tires; from now on it was much smoother. There was a little more traffic here, but still very light. 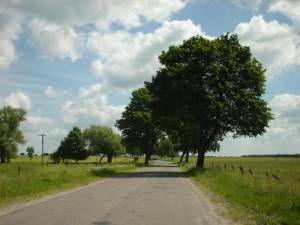 We rode north, alongside the Masurian lakes, through Bobrowko, Mikolajki (Nikolaiken), Woznice, Kozin, and Wilkasy to Gizycko (Lötzen). Not a really exciting town but there are hotels and supermarkets here. June 13. The tour continued east, first on highway 63 and then on 655 through Wydminy to Olecko (Treuburg). After a few km north, highway 653 continues east to Suwalki (Sudauen). Suwalki is not very interesting, but it was too late to continue to Lithuania so we stayed in the drab communist-style hotel Hancza near the little lake in the southwest. There are only two border stations from Poland to Lithuania, and Suwalki is close to both; the southern one can also be reached conveniently from Augustow. In any case, we avoided the Russian exclave of Kaliningrad, because Russian immigration procedures are so bureaucratically ornate that they border in the ridiculous (you need an approved invitation and itinerary). June 14. On Friday we got blown to Kaunas in Lithuania, via Marijampole. We enjoyed a fierce tailwind and rode in eerie silence at 40 km/h and more, on excellent asphalt and mostly wide shoulders, all the 130 km along A5 except near the end, where we fell for the first turnoff signed "Kaunas" when we should have taken the second. Even though the highway from Suwalki to Kaunas is supposed to be busy, that's relative in this part of the world - I counted about two cars per minute, except near Kaunas where we also got many very close passes by large trucks. We lost only half an hour at the border and its three checkpoints, because we passed the line and rode all the way to the gate. The length of the truck line was 2 km northbound and 8 km southbound. The last 10 km we had to ride into driving rain. Kaunas has shockingly ugly suburbs and an eight-lane highway along the river, complete with an abandoned half-finished soviet-style highrise complex. We stayed at the hotel Monela, near the east end of Kaunas' main pedestrianized shopping street, which is a little dilapidated but quite pleasant. They speak English. Kaunas is in the process of being overtaken by western brand stores in a major way. There is a huge "Media" supermarket and several Internet cafes here too. June 15. On Saturday we had to pay for the tailwind. 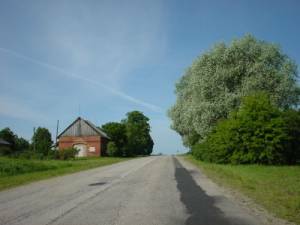 We rode 120 km north into a considerable headwind, first on highway 222 to the A8, then on highway 144 past Kediniai all the way to Seduva, along mostly quiet country roads with almost no traffic. The countryside was a little boring outside Kaunas, but turned into pastoral softly rolling hills with more trees and little villages. At Skemiai we finally found a grocery store ("Maitas Prekes") after 80 km. We got to talking with the locals, and one took us to his home, the one in the left picture above. He was a captain in the Red Army, stationed in Weimar in former East Germany where he picked up some German. His home was a modest traditional Lithuanian wooden house, with a large tiled stove. He insisted that we had some bread (Lithuanian dark bread with cumen is wonderful), ham, sausage, and eggs. We talked for a couple of hours, and in the end he packed up the ham and sausage for us and we could barely stop him from giving us a jar of juice that must have weighed ten kilograms. Very friendly people! 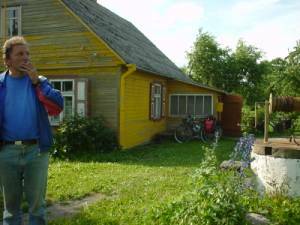 We rode on to Raudondvaris, a little town to the east of our route, and stayed at the pleasant, modern and quiet Prie Ezero hotel (370-92-44430). The right picture above was taken on this road. June 16. 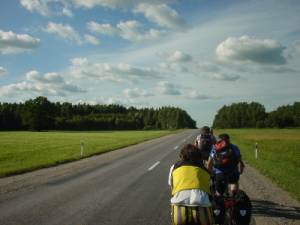 The next morning we rode straight west through Seduva and Radviliskis towards Siauliai, into a moderately strong headwind. We skirted Siuliai and rode through Ginkunai, and turned right onto A12/E77 to Joniskis. A short side trip led us to Kryziu Kaulas, a bizarre hill festooned with crosses, shown in the picture to the right. 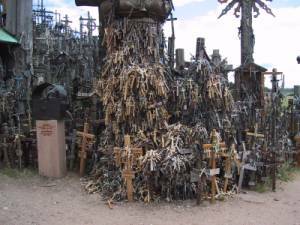 There are more crosses per square meter here than I ever saw before. Acres of them. Crosses on crosses on crosses, all sizes. We then rode to Joniskis, where we were originally planning to find a hotel, but we now had a favorable wind and it was too early to call it a day, so we rode on to the border. The procedure was tremendously inefficient and it took us an hour to leave Lithuania. In Latvia the road continues through Eleja to Jelgava. There was even less traffic here, not more than a dozen cars all the way, and the road was now lined with trees which took care of crosswinds. In Jelgava we stayed at the Hotel Jelgava (Liela iela 6 near the river, 371-30-26193). Jelgava itself is terminally boring. June 17. The first 12 km out of Jelgava towards Riga are rough asphalt, then the road turns onto the A8 with the usual smooth surface. Although a divided freeway, the A8 is legal for bicycles. It even has the occasional driveway, U-turn zones, and zebra crossings. Some freeway. The traffic was light as usual, and the ride was fairly boring. Just before entering Riga, we got treated to 2 km of rough cobblestones, the first on this tour. We found an extremely nice room at the Ragi un Dragi hotel in the old town of Riga. Recommended. After the short ride (45 km) we had all day to see Riga. 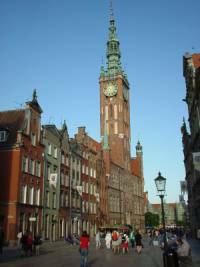 This was the first city after Gdansk that justifies a visit all on its own. The old downtown is beautifully restored with no sign of the slight dilapidation that we had seen so often during our tour. 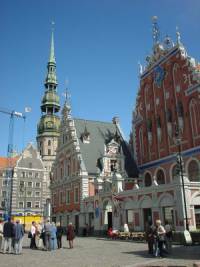 No trace is left of its Soviet legacy; Riga would fit right in with the most scenic of ancient European cities. You could take most of its extensive downtown and drop it off in Switzerland and nobody would find anything wrong with it. However, the elegance and perfection does fade a little outside the old downtown, and there may be a rather dilapidated courtyard behind those shining facades. We spent most of the time walking. The shiny metal roofs that we first mistook for a railway station are market halls, and there is a large outdoor market behind them. The downtown is divided in two parts, the old one to the west (left picture) and the new one, ``only'' a century old with gorgeous Art Nouveau buildings (right picture), and a nice park in between. June 18. Extrapolating the weather we expected strong headwinds and some rain for the rest of the trip and scheduled plenty of time. The next morning we had no wind and hot and sunny weather instead, so we started early and took the six-lane freeway from Riga through Babite to Jurmala, Riga's beach resort. Endless beaches, white powdery sand, almost no people. Close to the water the sand was packed hard enough to ride on, so we rode on the beach at the edge of the water for some 13 km. 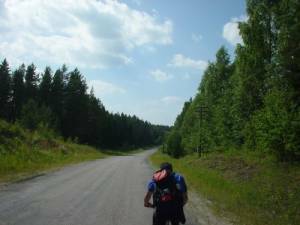 Then we got tired and returned to the road at Klapkalnciems, where we turned inland towards Tukums. Until here road parallels the beach, and every footpath to the right leads through the forest to the sea. The picture to the right shows the view. After Tukums we stayed on small side roads until we could no longer avoid the A10 highway, which we followed for 14 km until we turned left to Kandava. They have a helpful tourist info there, and a supermarket with an ATM. Another 9 km brought us to the very nice ``Viesu Nams Imulas'' hotel (www.imulas.lv, 31-31433, left side). June 19. Our first stop the next day was the northernmost vineyard of the world in Sabile, a rather unimpressive hill. A few km later, on the left, we found a little waterfall. Or so the guide claims. It's more like a very minor rapid, but a nice place for breakfast. 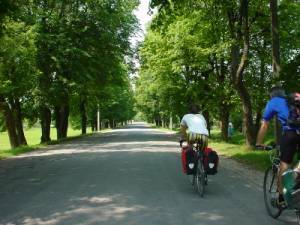 We then rode on to Kuldiga and Aizpute with no further distractions. Aizpute is a shabby little town, rather atypical of Latvia so far. The hotel had closed, which left only a run-down hostel full of children. Lots of bare concrete, rotting balconies, a fungus-encrusted staircase, antique Russian wiring (I couldn't resist showing this fine and well-aged piece of Soviet workmanship in the picture to the right), and a single shower in the entire building. The rooms were sort of tolerable though, except that the beds are too short for adults. They serve barely edible dinner too. The next hotel would have been in Liepaja. June 20. 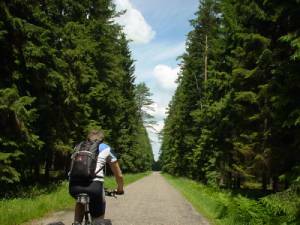 Our final day, with a short 50-km ride from Aizpute to Liepaja, a major port town. The road continues to be scenic and quiet until A9, where it becomes a little busier. We arrived early in Liepaja and spent some time in the pleasant but unremarkable downtown, finding ways to dispose of leftover currency. With bicycles we could get onto the ferry to Rostock in Germany early, around 21:00. June 21. The ferry takes two nights and the day. I sit here on the deck, edit this story, uselessly pushing data over infrared IP connections between my Zaurus and a Linux iPAQ, and generally not doing anything at all. We chose a Scandlines ferry, after finding out that Latlines ferries are basically rotting death traps.